Ronald and Travis Bays became friends through the work Travis was doing as a Peace Corps Volunteer in the Micro Enterprise Development Program in 2005. Ronald had never touched a camera before meeting Travis. One day he asked Travis if he could use his digital camera to take photos of the beautiful animals and plants in the community. He said sure. Three days later Ronald returned the camera with amazing photos. Afterwards, Travis asked him if he had any interest in starting a small business. Ronald said yes, but that he had limited business skills. Together they worked on a proposal to get a small grant to purchase him a professional camera. Since obtaining the camera Ronald has polished his small business skills and photographic techniques, producing postcards, calendars, tee-shirts and posters, becoming the Bahia Aventuras professional photographer. My name is Ronald Guzman Mora and I am a local photographer from Uvita Bahia Ballena, Osa, Costa Rica. I have lived in the Osa Peninsula for many years and have witnessed the incredible biodiversity that exists within its borders. 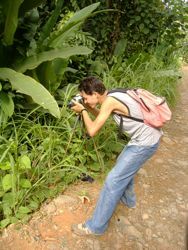 A year ago, with the help of different organizations and friends from the Peace Corps, I had the opportunity to begin showing my love of nature through photography; I obtained an 8 megapixel camera and the necessary business training to start my project of postcard, tee-shirt and photographic reproduction. Through these means I have developed an opportunity for tourists and locals alike to obtain an original product from the beautiful Uvita, Osa Peninsula, Costa Rica through the most sustainable means possible. Thank you for your support. Ronald Guzman Mora has the amazing ability to capture nature’s beauty at its finest. Ronald will come on any Bahia Aventuras boat and nature tours with you to capture these treasured moments, while you relax and enjoy the adventure! Any photo you see on the Bahia Aventuras Photo Gallery is available for purchase. Please contact Ronald, so he can help deliver the photos you want in the format you desire.